After a year long hiatus, General Motors has resumed the plant tour program for the Bowling Green Kentucky facility where the Chevrolet Corvette is built – now offering Corvette fans a chance to watch the C7 Stingray come to life in person. General Motors has been offering tours of the Bowling Green Corvette Plant in Kentucky for decades but in late August 2012, the automaker announced that they had to suspend the plant tour program as workers prepared the facility for production of the next generation 2014 Chevrolet Corvette Stingray. When the plant tours were suspended, the world still had not seen the new C7 Corvette so the decision to keep prying eyes out of the facility made sense – especially when you consider the fact that the retooling process would both interrupt production while also making the plant less handsome than usual. GM obviously couldn’t have the public looking for an early glimpse of the 2014 Corvette and with production stopped and the assembly line pulled apart for retooling, the company wouldn’t be able to assure a great tour experience. However, more than a year has passed and as the first shipment of 2014 Chevrolet Corvette Stingray coupes have reached dealerships around the country with production well underway, GM has re-opened the plant tour program to the general public. Officially, the Bowling Green plant tours will resume on October 14th with three tours each day running at 8:30am, 11:30am and 2pm. The Corvette plant tour costs $7 per person except for current GM employees, GM retirees and active military members who get in free of charge with proper ID. As there will probably be a big rush for people who want to see the 2014 Corvette being built, GM recommends that people make reservations rather than just showing up and hoping to get in. It should be noted that those on the tour are not allowed to take in any sort of recording device including cell phones, tablets and cameras so while you can experience the Corvette production process – you cannot capture it on film. “We are delighted to invite the public back into our facility, so we can continue our close-knit customer relationships and educate enthusiasts from around the world about the unique Corvette manufacturing process,” said Dave Tatman, plant manager. In addition to the public plant tours, the Bowling Green Corvette assembly plant is now open to the various customer experience programs are also set to resume. This includes the Museum Delivery option, the Buyer’s Tour option and the Corvette Photo Album option. The Museum Delivery program costs $990 and this allows the buyer to visit the Corvette Museum in Bowling Green where they will see their new Chevrolet sports car on the museum floor in a display of its own prior to taking delivery. 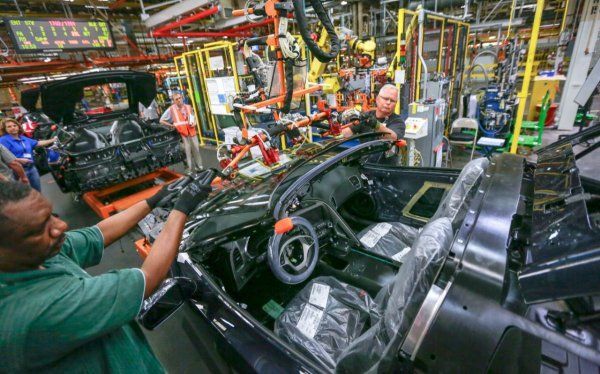 The Buyer’s Tour costs $800 and this option allows buyers to visit the Bowling Green plant to watch their Corvette travel down the assembly line – including areas that are not included in the normal public plant tour. Finally, the Corvette Photo Album option costs $700 and this program provides an album of images showing the buyer’s Corvette as it travels down the assembly line…which is an excellent option for those who can’t find the time to travel to Kentucky to participate in the Buyer’s Tour or the Museum Delivery. At the same time, the Corvette Photo Album can be combined with the Buyer’s Tour for a total price of $1,300 – presenting savings of $200 over the two packages on their own.